Hello Spring! You know Springtime has arrived when strawberries are already on sale at the grocery. Over a week ago, we bought about 6 pints worth of strawberries because my kids love strawberries and I usually give them fruits for snack in their school. However, we never got the chance to eat all of them because we were away for a few days. This was the time I met my sister who pleasantly surprised me with her presence on my birthday celebration all the way from the Philippines. When we returned from our trip to New York a few days ago, hubby checked out the fridge to see what food we still had (or perhaps he was just hungry and was looking for something to eat!). He then informed me that we still had a lot of strawberries that we should eat soon. I thought they’d be totally off already after a few days. Thankfully, most were still in pretty good shape and certainly eatable. In 10 minutes or less, you have a delicious, fuss-free, spring-perfect dessert that will delight everyone! In a glass or nonreactive bowl, place all the strawberries. Mix the remaining ingredients except the Mascarpone mixture. 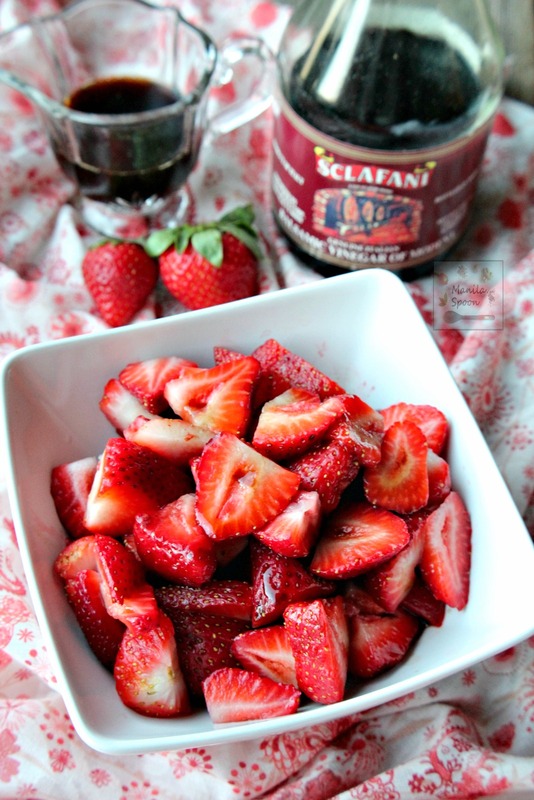 Drizzle the the strawberries with the balsamic sauce and stir everything gently. Divide into 3 bowls and top with the Mascarpone mixture. Serve immediately. That looks delicious Abby! And quite quick to prepare too. I'm loving all the flavors together in this dessert. Lovely. 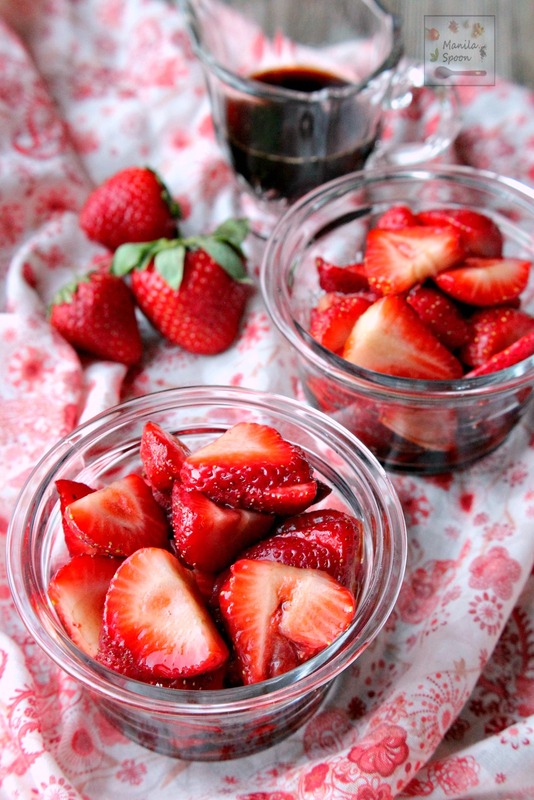 Those strawberries look heavenly! I really like the idea of mixing it with balsamic and mascarpone. Simple yet utterly delicious. Love this Abby. What a fabulous way to use your leftover strawberries! They look so inviting! Love such simple recipes!! 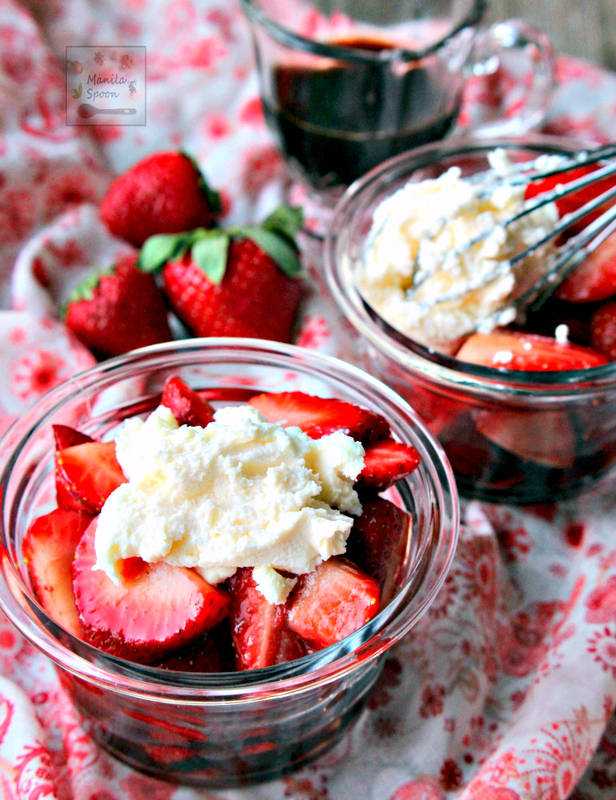 These are strawberries with mascarpone cheese makes a really light and refreshing dessert! Very delicious, this is such a perfect Spring Dessert and a beautiful Mother's Day treat as well. Goodness this sounds like pure and utter perfection! I need this in my life! I have had balsamic strawberries in a salad before, but I haven't had it as a dessert like this. Sounds like it would have been perfect for an Easter dessert.